Getting around in Dubai is fairly easy, but be aware of the rush hour timings in certain areas. Dubai has an extensive road system, which only keeps getting expanded and improved. It is also easy to get around in the city by public transport, such as metro, tram, bus and water taxi. Dubai’s taxis are available to hail nearly everywhere at just about any time, day or night. If you prefer to schedule a ride, you can call for a Dubai taxi pick-up at +971 4 208 0808. To hail a cab, look for a stationary or approaching cab with the yellow light on (red means it’s occupied). Please note that taxis with the pink color are for ladies only. When visiting malls, there are official taxi stands arranged. Just follow the signs or ask a staff and they will guide you. While taxis are reasonably priced in Dubai, the price per kilometer does change depending on a few factors, like tolls or the time of day. If you prefer to use an app to book a ride, Uber or Careem are available. Feeling extravagant? Book an Uber chopper for a bird’s-eye commute. Dubai has nearly 1,500 buses circulating around the city and air conditioned shelters to keep you cool on your way (which is needed during the summer heat! ), this is a great budget option for getting around. Travel like a resident on the city bus or book an open-top hop-on, hop-off bus tour to hit the main tourist sites. And most convenient of all, the Nol smart card** allows you to pay not only your bus fares, but also your metro fees. The metro is a world-class, fully-automated, driverless railway system. Most of the metro rides above ground providing a great view across the city while you travel to landmarks like the Dubai Mall, Dubai Marina, the Gold Souk and Dubai’s financial district (DIFC). The metro currently consists of two lines – Red Line and Green Line. The Red Line basically takes you from one end of Dubai to the other, while the Green Line is running in the old part of the city (Deira/Bur Juman). 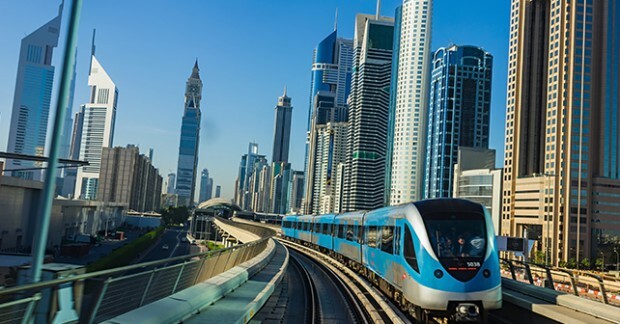 Dubai Metro tickets must be purchased in the form of a Nol card – which can also be used to pay for bus, tram and taxi fare – and rides can cost as little as AED3. Discover the city by its metro stations or use the journey planner app, Wojhati, to make the most of your Dubai itinerary. The Dubai Tram runs from Al Sufouh to Jumeirah Beach Residences in 42 minutes. Running on the Nol card, the tram provides access to destinations like Palm Jumeirah, Dubai Marina, Jumeirah Lakes Towers and more. The tram connects directly to the Palm’s monorail station, which runs from the trunk of the Palm to the iconic Atlantis, The Palm. The RTA network is divided into seven zones, with fares depending on the number of zones traversed. Travel requires the purchase of a Nol ticket or card (nol is Arabic for ‘fare’) at ticket stations or from vending machines before boarding. Cards must be tapped onto the card reader upon entering and exiting at which point the correct fare will be deducted. Nol Red Ticket (Dhs2, plus credit for at least one trip) Must be pre-loaded with the correct fare each time you travel; can be recharged up to 10 times; may only be on a single mode of transport at a time. Fares: Dhs4 for one zone, Dhs6 for two zones, Dhs8.50 for three or more zones, Dhs20 for the day pass. Nol Silver Card (Dhs25, including Dhs19 credit) With pre-loaded credit, this works on the pay-as you-go principle with fares deducted. Get this card if you’re going to make more than 10 trips. Fares are Dhs3 for one zone, Dhs5 for two zones and Dhs7.50 for three or more zones. For full details, see www.nol.ae.